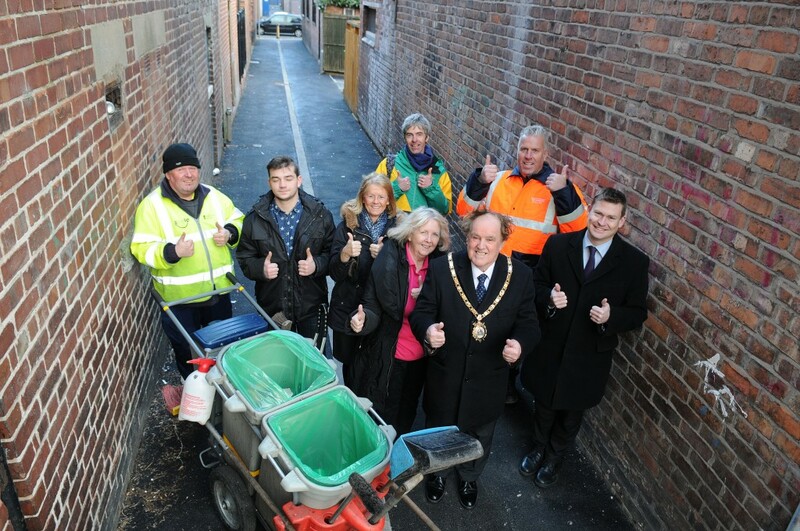 10 February 2015 – An alleyway between Exeter Road and Cambridge Road in Ellesmere Port has undergone refurbishment as part of a programme of ongoing improvements in the town centre. Local traders on Whitby Road had contacted the Council to help improve the well-used alleyway, which was in a poor state of repair and suffered from littering. The Town Centre Improvement Advisory Body agreed to the allocation of funding to complete the project, which included resurfacing with a new tarmac surfacing and installing gullies and removable bollards at both end of the alley. The works were delivered by local contractor W. E. Parsons from Victoria Road, Ellesmere Port. The improvements are contributing towards works to transform the heart of Ellesmere Port, prioritised in the Vision and Strategic Regeneration Framework of the Ellesmere Port Development Board. The Council’s Executive Member for Culture and Economy, Councillor Stuart Parker said: “This alleyway is very well used, both by local residents to access their homes and by shoppers visiting nearby Whitby Road. From left to right: Bernie Morris – CWAC Streetscene, Joshua Browse – The Uniform Shop, local landlord Julie Simpson, Elisabeth Featherstone – Party Place, town centre improvement manager Jochem Hollestelle, Mayor of Ellesmere Port Councillor Brian Jones, contractor Richard Parsons and local ward Councillor, Justin Madders.